For example, a key control and management system is the best way to store, track and account for the panic button fobs in growing use by hotels and hospitality businesses. A new law in effect in Seattle, New York City and other locations now requires hotel employers to provide a “panic button” to housekeepers and other workers. For employees who enter guest rooms, this can protect them in case of harassment or other threats. Using one of these buttons enables a worker to instantly broadcast a call for assistance from a security officer or other authority. Typically the buttons are on key fobs carried by staff members. Many of today’s hotels must purchase these panic buttons, sometimes in large numbers, to properly equip personnel. Because housekeeping staff follows a 24-hour schedule, it makes financial sense for the fobs to be shared among employees. This necessitates a way for hotel management to store unused panic buttons and to account for each one at all times. When not in use, each fob can be locked safely in a key control cabinet, and only removed or replaced by the individual who is scheduled to use it at that time. All activity can be tracked, so management gets a clear picture of whether employees are adhering correctly to the program. Another use case for key control systems that house more than just keys can be made by the growing popularity of encrypted authentication tokens or fobs to ensure safe log-in to websites that require a password for access. As more and more individuals and businesses are discovering, hackers can get around virtually any password protection at will. This puts personal information, intellectual property, financial records and other important data at risk. A number of manufacturers have addressed this problem with new hardware-based authentication devices. These use USB, NFC (near-field communications) or Bluetooth technology, typically via U2F or FIDO2 protocol, to enable two-factor authentication. The device creates a one-time cryptographic code and pairs it automatically each time the user visits a previously-authenticated website. This provides much stronger and safer protection than most of the passwords in use today. Many hackers find that the easiest way to get into a network is to break into a facility and steal a laptop or server. With this in mind, organizations using the tokens must protect them from being stolen. Key control systems provide an ideal way to secure, protect and track them. 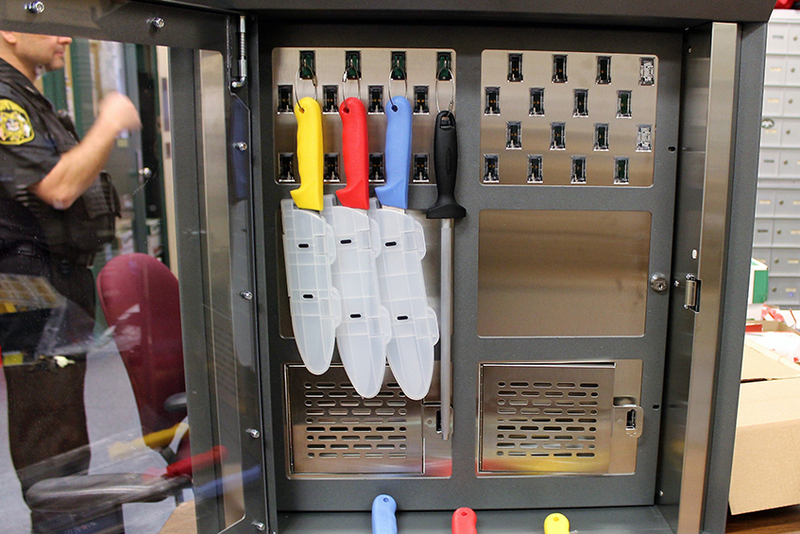 While fobs and tokens may seem a natural fit with key control systems, it might be surprising to learn that some organizations use them to store potato peelers. In a correctional facility kitchen, inmates are permitted to use tools such as knives, forks and peelers. Naturally, all of these must be carefully controlled, counted and tracked in order to ensure no sharp implement ever leaves the kitchen. In the hands of a dangerous person, a steel potato peeler could be used as a weapon and could cause serious harm or worse. Beyond protecting the items, the system can be configured so that each has a specific time limit set for its use. Alarms can sound and notify authorities if a peeler, knife or other implement has not been returned on time. In addition to kitchen tools, firearms, ammunition, Tazers and other weaponry can also be kept in a key control cabinet at a correctional facility. In all of these cases, access to each individual device stored inside the key control cabinet is limited to authorized individuals. Permissions are verified by credentials, which can include biometrics such as iris recognition, fingerprint or facial recognition for added security. From fobs to firearms, panic buttons to potato peelers, there’s almost no limit on what you can secure and protect in a key control cabinet. Discover how key control and asset management systems can be an effective way to boost security by downloading our free whitepaper.